I found this beauty along with an old Windsor frame leaning up against someone's garage. 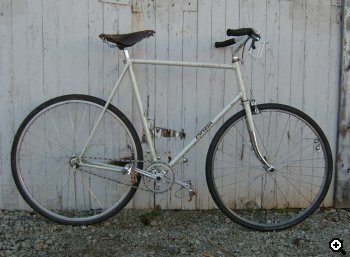 I had been searching for months for a tall old steel frame. Searching the streets that is. I didn't want to pay for one. I knew that when it was time the right frame would present itself to me and it wouldn't cost me money, only patience. Now, I'm not implying that I planned to steal a bike. I wanted to go about finding a frame as though it were a ripe fruit growing from a tree. It reminds me of a book I am reading where the author talks about the way some Native American scouts would obtain the wood for a new bow. They would supposedly fast while searching for days for the right tree. With patience this tree would present itself. It may have been a young tree that was crowded between other trees with little chance of growing to its full potential. It may not have been the most choice piece of lumber but the right piece to fufill the scout's purpose. Anyway, these frames looked like they were headed for the dump, so I went up and knocked on the front door. A dog started barking and I heard an old man yelling at the dog. "Shut up Sammy, Shut up goddamit!" I thought maybe I should just walk away. After what seemed like an eternity of this the door cracked open and an old, withered man gruffly said "Whatdya want?" I told him I was wondering if he was getting rid of the bikes by the garage. I cleared my throat and repeated myself. He glared at me. "Oh" He said "Take em' and take those wheels too." I loaded the frames and wheels onto the back of my ol' grocery getter Schwinn and looked up at the house again. The old man was watching me. He cracked a smile and gave me a big thumbs up. Score, I thought. So I walked away with not one but two good frames that were my size, plus some wheels. The Univega frame is a joy to ride. It feels so comfortable with those handlebars up nice and high and a fistful of seatpost below my brooks saddle. I have been scorchin' all around town like an arrow shot from a new bow. Shaun designs ace cycling caps in Portland, Oregon and would love to make one for you.